A great step-by-step guide to creating lovely glass projects using stained glass and copper sheet foil. Projects include a address plate, picture frame, mirror, boxes, and more. 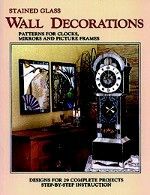 29 complete design projects including a 30" high granddaughter clock, 11", 22" & 29" oval mirrors, a pendulum schoolhouse clock, picture frames and much more. Plates of each pattern design, with step-by-step instructions. 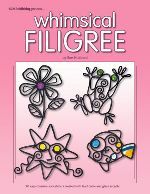 A follow-up to the popular Fanciful Filigree, this collection of 19 patterns uses lead came, jewels, glass globs or fused glass accents to create delightful suncatchers to brighten any window in your home. Shape lead came into lively characters (suns, moons, fish, frog, hummingbird, flowers and more) that come to life with the addition of colorful glass accents. 15 full size patterns for stained glass weathervanes vary in difficulty to satisfy craftspersons of every ability. Each pattern comes with all the information you need to construct the project plus complete details on purchasing and assembling the weathervane hardware. Patterns include a rooster, cow, horse, duck, tractor, fish, bear, bicyclist, truck, sun, eagle, boat and more. 17 all new designs in full color and full size for stained glass weathervanes. Complete instructions and material lists are included for each design. Patterns included are: frog, flying pig, bird dog, fox, old man winter, marlin, fisherman, elephant, lighthouse, wolf, duck, swan, horse and more. 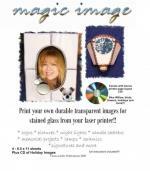 Print your own image on glass! Looking for a unique personalize gift? With this software you will be able to print your own personal durable transparent images for stained glass from your laser printer. You can put your family photo on a special glass ornament or even add your favorite holiday memory to a night light or picture frame! Package includes 4 - 8.5 x 11 magic image sheets, one CD with pre-arranged layouts and full instructions.